We first learned of Ideal.com at last year’s HR tech conference and after recently hearing the news of the new $3 million round of funding invited them to the show to talk about their technology and how they help employers find talent...according to their homepage...Ideal automates tedious and time-consuming tasks including manual resume screening and candidate sourcing. Their co-founder, Shaun RIcci spoke to Chris Russell from their Toronto Headquarters. Tell us what Ideal does? Congrats on the new round of funding can you tell us how that came about and what your plans are for the capital? Tell us the story of the domain name and how you came to acquire it? Your technology is A.I. based so describe that part of the technology? How does it integrate with your ATS? Whats the deliverable? 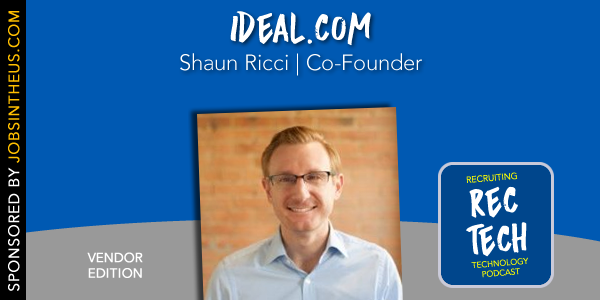 What are some results your customers have seen by using Ideal? How are people using AI in recruiting now? Will artificial intelligence tools such as Ideal take jobs away from recruiters? What are your predictions for recruiting and AI's role in the future?